Pretty much every time I visit my parents, Mom and I deliver a few things to the thrift shop. Or she gives me things - mostly dishes and other household items. She is trying to de-clutter (as are most of us I think). But last time I visited, she wanted me to toss a bunch of old magazines in recycling. And I couldn't do it. I put them in our van instead. Which isn't ideal, because I really need to de-clutter too. 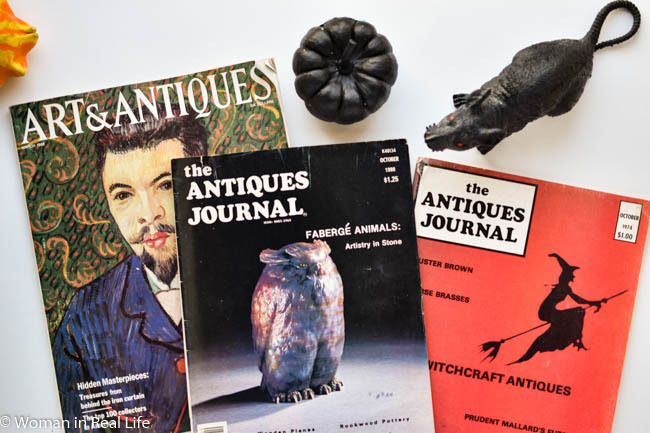 The magazines are mostly old editions of The Antiques Journal from the seventies and eighties. I have a weakness for magazines. (I recycled over 300 in the past year and it was hard because usually I read them before tossing them - I had to let that go quite a bit.) And these old antiques magazines are so cool. The subjects are fascinating. 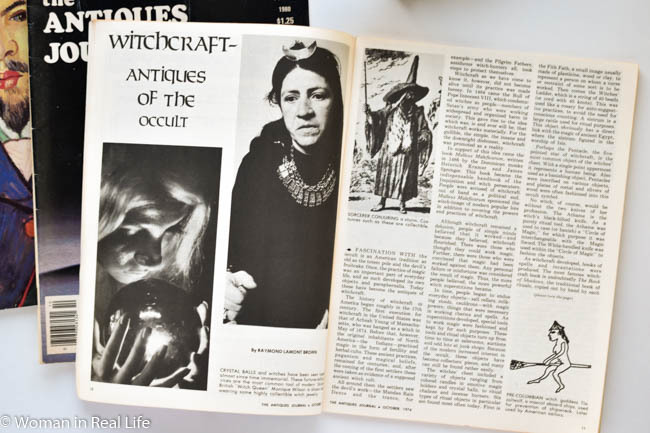 Since it was Halloween last night, I thought I'd share a bit of the October 1974 edition of The Antiques Journal, with a section devoted to witchcraft antiques or "antiques of the occult." Who would have thunk that you could seek out witchcraft antiques? Not me. I guess there are collectibles in just about every category. Now, I really don't want to keep all of these magazines, but I'm thinking of donating them to a library sale or something, so somebody who is similarly magazine-addicted can get some use out of them. Link up for two weeks! Please join this week's Vintage Bliss Tuesday party below. I made today's linky good for the next two weeks, because that's about how often I get around to posting. So come back and link up to this post again next week. Joann, I think your idea to donate them to a library sale is your best option for finding people who would cherish them. I think there is a category or just about anything you can think of to collect. LOL! Thank you for hosting.